Home of the original Slingshot Flying Monkey and Flingshot Flying Monkey! IT FLIES....IT SCREAMS......IT'S SLINGSHOT FLYING MONKEY! 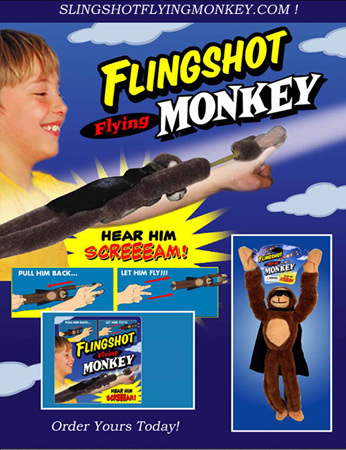 THE ORIGINAL SLINGSHOT FLYING MONKEY TOY THAT IS ONE OF THE HOTTEST TOYS AROUND. PLACE HIM ON YOUR FINGERS, PULL BACK AND LAUNCH, THEN HEAR HIM SCREAM AS HE FLIES THROUGH THE AIR! HE HAS HIS FLYING GOGGLES AND HIS CAPE TO KEEP HIM BALANCED. HE CAN FLY HIGH OR HE CAN FLY LOW. SLINGSHOT FLYING MONKEY IS NEVER SCARED AND KEEPS ON SCREAMIN' WITH EVERY FLIGHT! Brand New with Flying Instructions.